Eliza Gilkyson, John Gorka, and Lucy Kaplansky have played on each other’s albums and shared concert stages, but the idea for a group album surfaced when they played together during Red House Records 25th Anniversary tour. The experience was so positive they decided to record an album. Ask experienced solo artists why they’re solo artists instead of members of a band and you’ll get an earful on the issues and personal politics involved in musical partnerships. Red Horse isn’t an attempt at group-forming as much as it is an exercise in collaboration. The artists brought some of their most emblematic material and used the other members to fill out the arrangements. 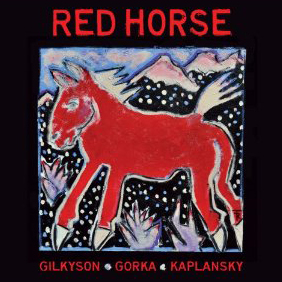 On Neil Young’s “I Am A Child” Gilkyson handles lead vocals and serves as “song boss.” On Gilkyson’s “Wild Horse,” Gorka leads, while on Gorka’s “Blue Chalk” Kaplansky takes the reins. In each case, the song leader is prominent and the other principals serve as accompanists. None of the songs get a full trio treatment where everyone must add equally to the song. Guitarslinger extraordinaire Duke Levine adds his wizardry on guitar, mandola, lap-steel, and baritone guitar. The sparseness of the arrangements is refreshing. The ’70s proved that, with rare exceptions, the super-group concept of putting solo artists together and expecting magic rarely works. Red Horse isn’t an attempt to duplicate the idea. Instead, it’s a collaboration based on music rather than marketing. The results will please anyone who values intelligent music making.